After a brief foray into the uncomfortable position of being publicly humiliated, the American Board of Internal Medicine is now telling is they have begun a "transformation" of their Maintenance of Certification program. They said they got "it" wrong. But instead of understanding "it," they want practicing physician to forget "it" and, instead, refocus our efforts to redefine "it." To begin that process, they are publishing seemingly heartfelt missives claiming they've been "thinking a lot ... about the values that we physicians share." Even after squandering any semblance of trust by their inexcusable financial behaviors, they pretend to understand how practicing physicians feel and claim "we are united in our passion to do right by our patients and our commitment to lifelong learning." This is a straw dog. They have taken accountability for the most trivial component of what they did to the practicing physician community - as if they hired damage-control consultants. Instead of coming clean, we now see they have begun a campaign to groom vulnerable physicians into believing their storyline so their largess can continue unabated. For who is more vulnerable than a junior practicing US physicians saddled with huge educational debt? Who is more vulnerable than the junior physician trying to find a job as an employee in a large health care system hell bent on cutting costs? Who is more vulnerable than the majority of physicians who have lost their independent practices and now are placed in the ethically impossible position of serving two masters: their patients or their employers that insist they do more with less? Like a perpetrator trying to identify areas of psychological weakness in the vulnerable practicing physicians, they continue to attempt to position themselves as our savior, rescuer, and someone who holds us in the highest regard. Trust between physicians is critically important. We rely on our colleagues in matters of life and death every day. Actively practicing physicians cannot tolerate faux trust or press-release trust. But the members of the ABIM wouldn't know about that. They sit on their insulated perches forcing their colleagues to pay into their flawed system first every ten years and now every two. They have assembled a rich war chest of cash assembled on the backs of their practicing colleagues and then proceed to self-select their finest sycophants to join their merry band of highly-paid regulators. And remarkably, we now find that their unproven pay-to-play scheme uses the federal government as imprimatur. If you are named in a medical liability lawsuit, how will it appear when it is noted that you have not recertified through ABIM but have instead tried to show that you are “certified” through a process that has not been widely accepted and whose requirements are minimal? If you have a time-limited certificate from ABIM, are you willing to forfeit that primary certification in internal medicine and/or a subspecialty of internal medicine when that certificate expires? Recognize that, after your current certificate expires, not participating in ABIM’s MOC program means more than just being listed as “not participating in MOC.” It means that you are no longer certified, i.e. your initial certification is no longer valid. Is the fee for an alternative pathway reasonable considering both what you are getting as well as the expenses of the group that has developed the alternative pathway? For example, a fee of $169 every 2 years is almost half of the ABIM’s internal medicine MOC fee, but the alternative organization has no program or product development costs, as all it is doing is sending an electronic certificate (there is an additional charge for a paper certificate). And as if this were not bad enough, the ABIM Foundation continues to use Christine Cassel, MD, former President and CEO of the ABIM, as their spokesperson on matters of waste in our health care system in their highly-produced videos to the public when they themselves have squandered millions. The ABIM Foundation never mentions they used coerced physician testing fees to fund their Choosing Wisely Campaign and to purchase lavish condominiums for themselves. They never disclose (and have no future plans to disclose) their many years of conflicts of interests with consulting groups, think tanks, hospital groups and little sweetheart government agency grants (kickbacks?) with practicing physicians or the public. They see no problem squandering $3.3 million dollars of physician testing fees on a contrived promise of psychometric testing techniques to add value their system. They see no problem collecting and circulating practice and meaningless survey data to their many corporate affiliates. And worst of all, they have no plans to examine their sister organization's practice of failing as many as 22% of their test takers without ever evaluating the impact of their actions on a physician's ability to practice or the impact such an action has on the doctors' patients. The ABIM and their professional society supporters have irrevocably lost the trust of America's practicing physician community. They can't just "groom" this away hoping for its preservation or offer threats in the MOC program's defense. What's done is done. The question now becomes, can they and their many supporters ever earn it back? Related: (registration required) "Physicians are Outraged Despite ABIM Apology for MOC Mess" Medscape - Note: 237 528 comments and growing. 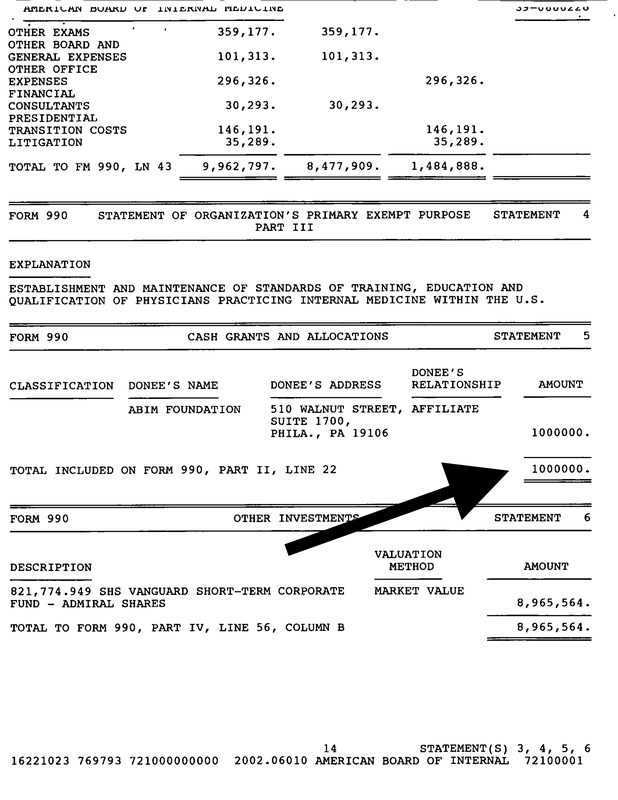 Why would the American Board of Internal Medicine (ABIM) leadership want the world to believe that their own ABIM Foundation was created in 1999? Might it have been because they didn't want to reveal their past? 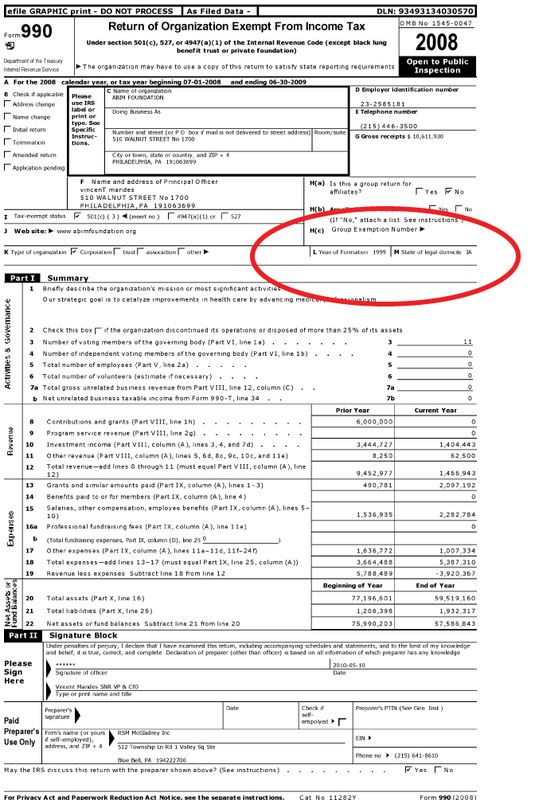 Based on public record, it appears they have repeatedly misrepresented the date and location of origin of the ABIM Foundation on Internal Revenue Service Form 990 tax forms since at least fiscal year 2009 and did so to shelter multimillion-dollar write-offs for their investment portfolio on the backs of physician testing fees. 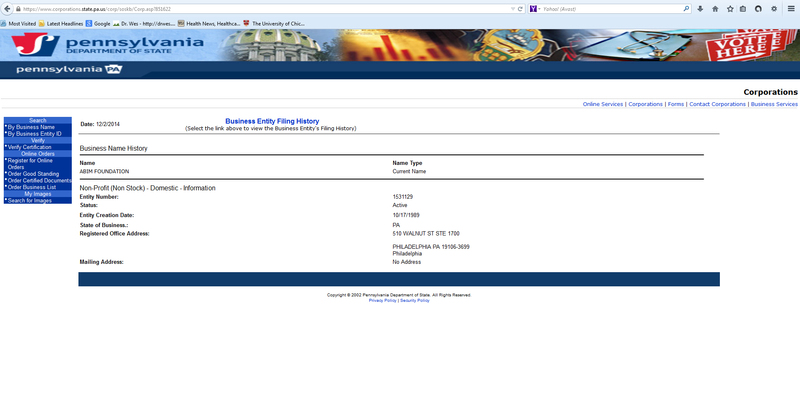 Recall that both recent ABIM Foundation's Form 990's and their website have claimed that the ABIM Foundation was domiciled in Iowa and established in 1999. Recall also, that in my prior research on the ABIM and their Foundation that I asked the current President and CEO, Richard Baron, MD, to explain the discrepancy between the tax form filing information and public record that claims the Foundation was created on 10/17/1989 in Pennsylvania, yet I received no clear explanation for the discrepancy. 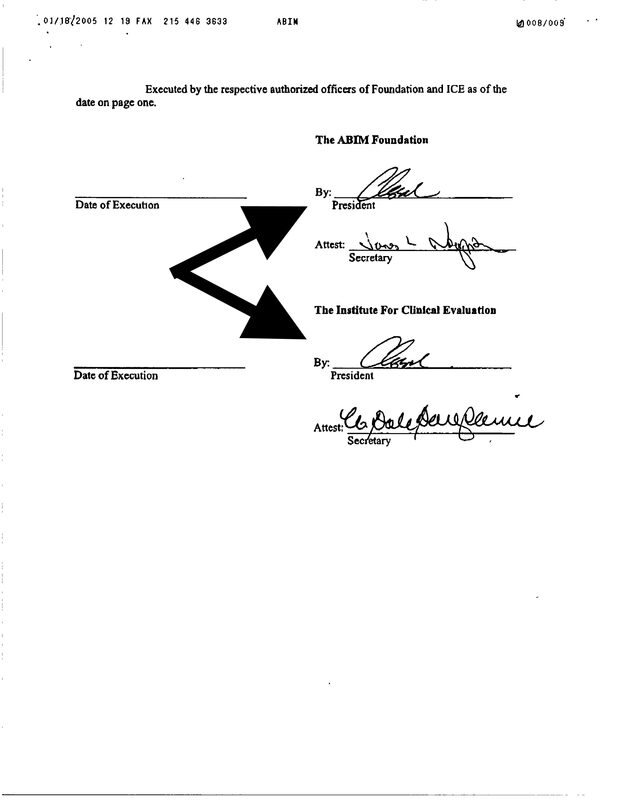 This date of origination of the ABIM Foundation is important, because if it was created in 1989, the origin of the Foundation would precede 1990, the first year that medical board certification was changed from a life-long designation to a 10-year time-limited status by the American Board of Internal Medicine. 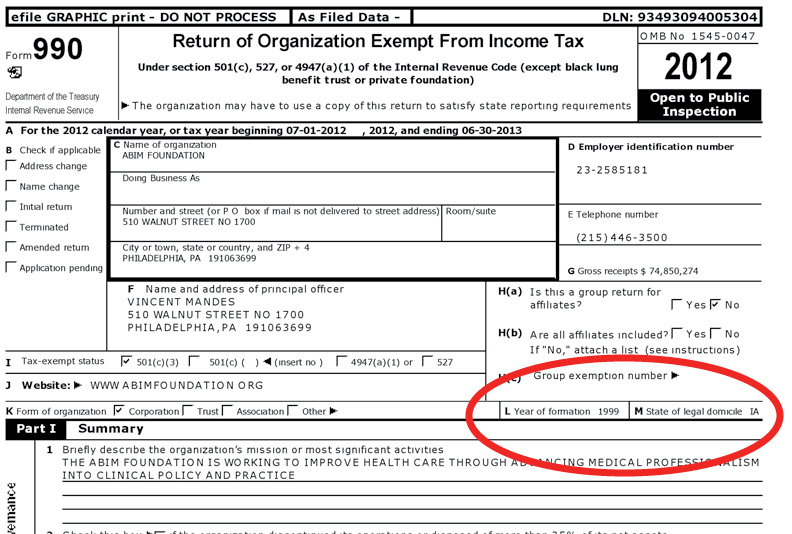 Careful review of the ABIM Foundation's fiscal year 2004 tax forms shows the ABIM Foundation and a separate little-known 501(c)(3) organization, the Institute for Clinical Evaluation (ICE), merged. It appears ICE was created in Pennsylvania in 8/25/1997 by the ABIM Foundation "to assess the usefulness of proficiency testing to the profession." "Several months ago, the ABIM decided to create, through its Foundation, an independent non-profit organization called the Institute for Clinical Evaluation (ICE), which will assess the usefulness of proficiency testing to the profession. In this context, ICE has the potential to positively influence the development of these standards. At the same time, we can be sure they are compatible with broad-based certification and recertification programs. The Board thinks that ICE can develop collaborative arrangements with professional societies to bundle education and evaluation into a single process. This process would be educationally efficient, credible to patients and acceptable to agencies and institutions responsible for the health and safety of the public. For the recertification program, the Board is developing a series of practice-assessment modules that allow diplomates to assess their preventive practices, receive feedback from patients and their colleagues about the quality of their professional services and assess the effectiveness efficiency of their clinical practice. The first of these modules is on clinical prevention and will become available this month." 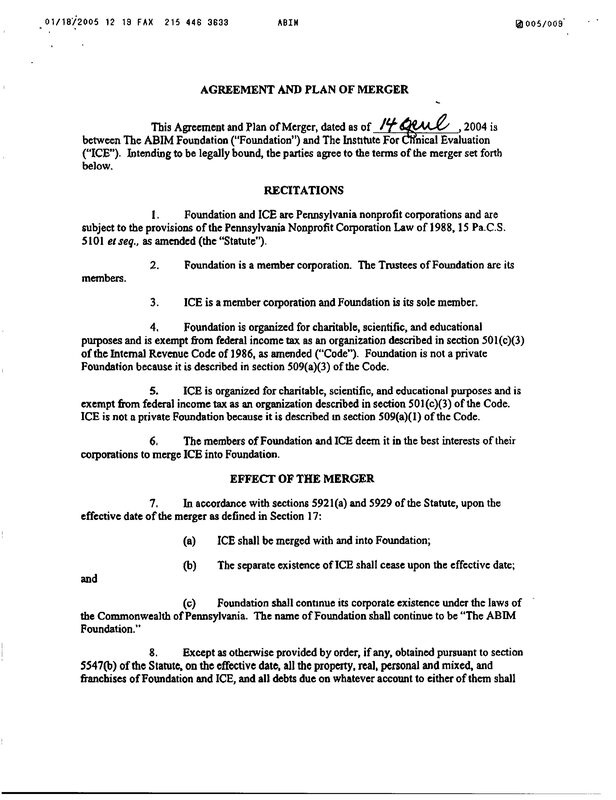 But when that organization could not prove such usefulness and spent funds like a drunken sailor to support its non-physician Chief Operating Officer, John J. Norcini, PhD, it appeared the leadership of both organizations later deemed it "in the best interests of their corporations to merge ICE into Foundation." Christine Cassel, MD signed the "Agreement and Plan of Merger" as President of both organizations. 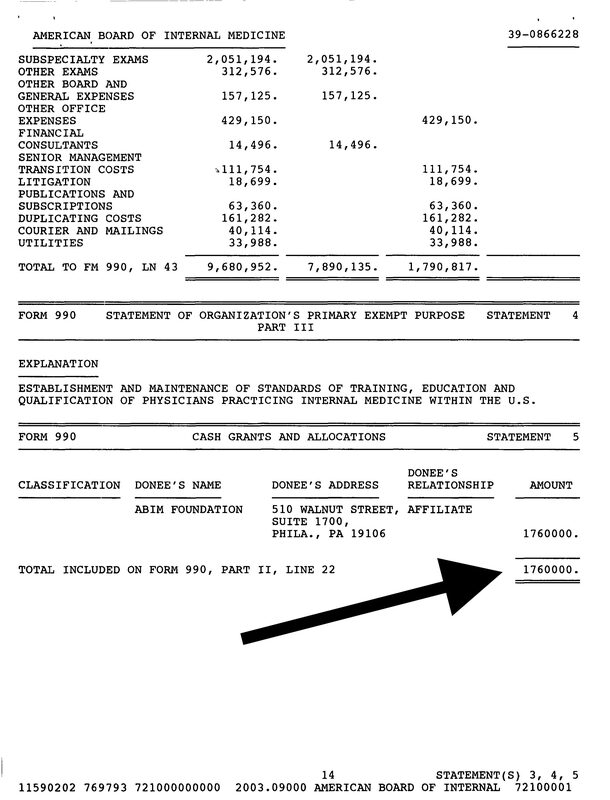 With the merger the ABIM Foundation wrote off a $3,347,109 loss from ICE. It appears that grants were made from the ABIM (who receives 97% of its funds from physician testing fees) to the ABIM Foundation in the three years preceding the merger to handily offset this loss: $1,600,000 in FY 2002, $1,000,000 in FY 2003, and $1,760,000 in FY 2004. 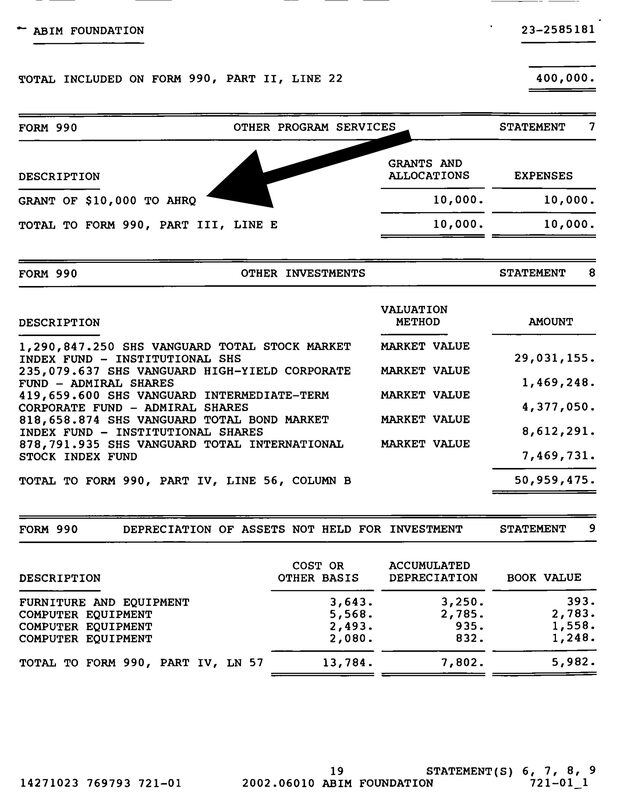 So what we now know, is that the ABIM Foundation clearly existed before 1999 counter to what its many tax forms and webpage suggest. In my opinion, this misrepresentation on their tax forms and webpage was not just a simple mistake, but was used as a cover-up to the physician community and the public (and perhaps the IRS?) of a $3.3 million dollar loss so they could avoid ridicule over their lack of proof of the value of their testing program while continuing to justify their high salaries and ever-higher testing fees while simultaneously leaving the multimillion dollar investment portfolio held by the ABIM Foundation untouched. When the American Board of Internal Medicine initially posted their 2014 audited financial report, they neglected to publish the itemization of how finances were split between the ABIM and its Foundation with the most recent financial disclosure. 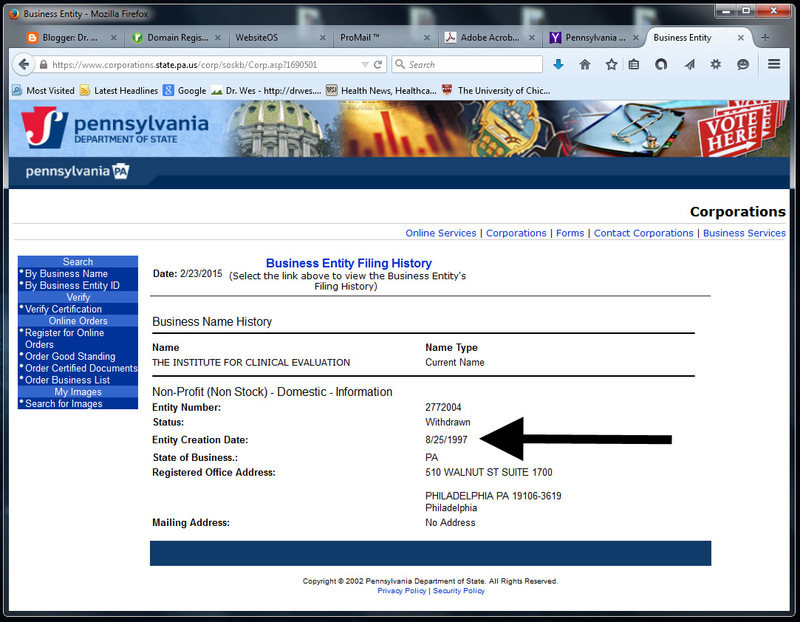 Now it seems the most recent ABIM consolidated financial statement was revised and posted online. The breakdowns that were neglected offer additional insights into the lavish spending of the ABIM, including over $20 million of their $54.5 million physician-paid revenues on salaries (37% of annual revenues and far different than disclosed on their webpage), a $591,389 fee for "recruiting and employment agency fees," a $348,060 "special severance payment" (page 25, perhaps for Dr. Cassel's departure from the organization in 2013? 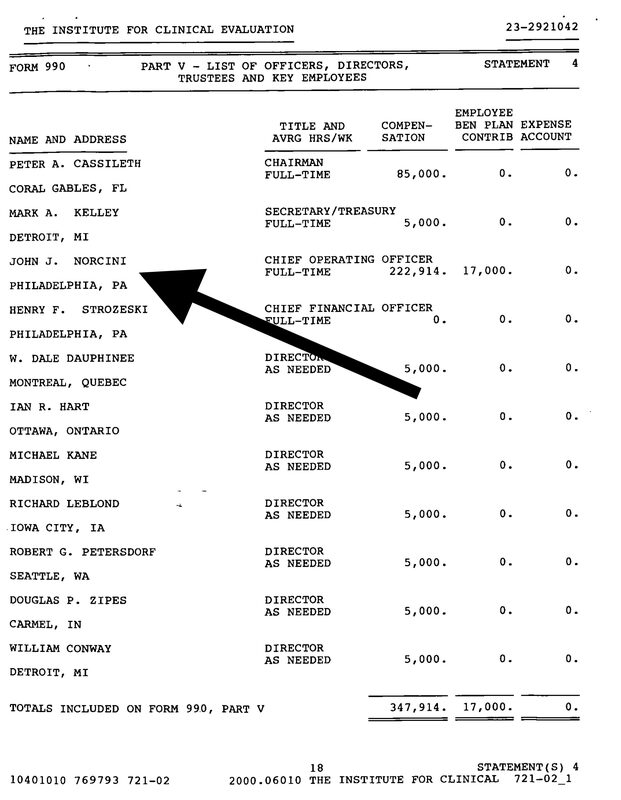 ), $2,677,600 in payments to consultants (page 24), and $234,884 paid to "publications and subscriptions" - page 24). I would like to commend the ABIM for taking this action. However, this action does little to quell the concerns of the practicing physician community of the legitimacy of the ABIM's MOC program in improving patient outcomes and opens additional concerns regarding tactics used to promote their MOC product for which they, themselves, provide little to no educational content. So what does a son say to his mother for the very last time? What does he whisper in her ear? I will say "I love you." I will say "thank you." I will say "God bless you." I will say "I'll miss you." I will say "You've been the best mother a son could ever hope for." I will say nothing, probably, and cry. Go in peace knowing you gave your family more than they can ever repay. Know we'll always be reminded of your kindness, your tenderness, your gentleness and care. 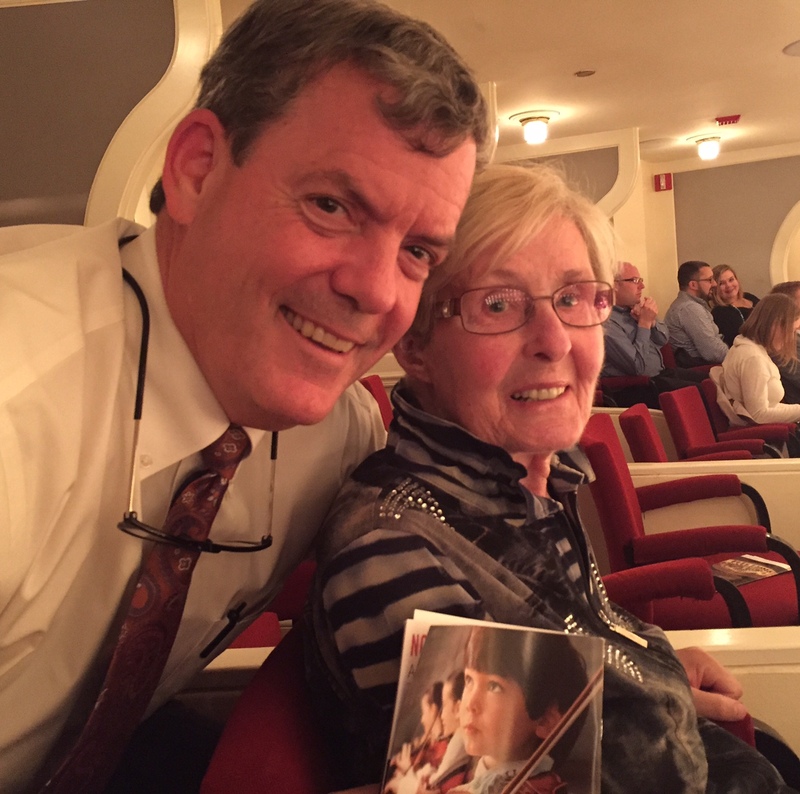 Be proud of what you've accomplished in your 89 years, especially with your family. You were our glue and always made your home so welcoming. You taught us the art of the written word and the special place for whimsy. Hundreds of kindergartners and first-graders that you taught all those years will miss you too. Thanks for being so wonderful to my kids - they will always remember your kindness, thoughtfulness, compassion, warm home and tender words. Give Dad a high-five when you see him for me. We'll think of you every time we water the flowers, tend the garden, make a fire, cook a meal, attend the theatre, play guitar or gather as a family. Until we meet again, God bless. Thank you for everything you've taught me, showed me, and gave to me all these years. You'll always be my compass. Imagine, a piece about unsavory financial practices and possible corruption is published about one of the members of your flotilla. That member of the flotilla responds, but the response it met with pushback by the practicing physician community. The Mothership, already nervous, gets more nervous. The Mothership calls her public relations firm to ask what to do. Things must be neat and tidy, just like their "new and improved" webpage. "We can't be lost on our messaging to the public," they say to the PR firm. "We need to have 'alignment' with our core values and motives." So, the public relations firm proposes a strategy. It is reviewed by the leadership of the Mothership. They like how it sounds. So they send a boilerplate press release to each member of the Mothership's flotilla. No, there's no collusion going on among professional societies. None at all. Nothing to see here folks. Now, can we move along and just ask doctors to keep paying those high re-certification fees? "Now this is not the end. In a widely circulated mea culpa announcement today, the American Board of Internal Medicine (ABIM) deployed some chaff in an attempt to ward off a flurry of incoming Exocet missiles aimed squarely at its years-long history of corrupt and coercive financial dealings, gross mismanagement, and entirely unproven Maintenance of Certification (MOC) program by saying simply, "We got it wrong and sincerely apologize. We are sorry." In an effort to project an image of sincerity, the ABIM agreed to "immediately suspend the Practice Assessment, Patient Voice and Patient Safety requirements for at least two years" and "hold their pricing at or below 2014 levels until 2017." It was clear that they sense themselves becoming increasingly irrelevant thanks to the efforts of Paul Tierstein, MD and his much cheaper NBPAS.org. To align themselves with the NBPAS, they also promised in their FAQ page "to work toward recognizing most forms of CME as fulfilling ABIM's MOC expectations for knowledge self-assessment." Better yet, they even agreed to set up a Google + community that doctors can join to discuss things! There now, good working doctor, feeling better? Now can we move along? But perhaps we should ask first: Why MOC at all? Contrary to years of propaganda promoted through pseudo-science and journal article citations on the ABIM's website, might MOC have really been created because the ABIM's consolidated fund balance dropped 43.2% from $54,009,086 on June 30. 2001 to $30,691,329 by June 30, 2013 while the Standard and Poors 500 index increased 37.7% over the same period? Said another way, maybe MOC was created because the net assets of the ABIM diminished from negative $10,930,327 to negative $43,150,390 from 30 June 2003 to 30 June 2013 while their leadership and board members did little more than pad their resumes so they could apply to the next insurance company or National Quality Forum job opening. Or maybe MOC was created to help fund the high salaries and lavish lifestyles of its many officers and administrative staff. 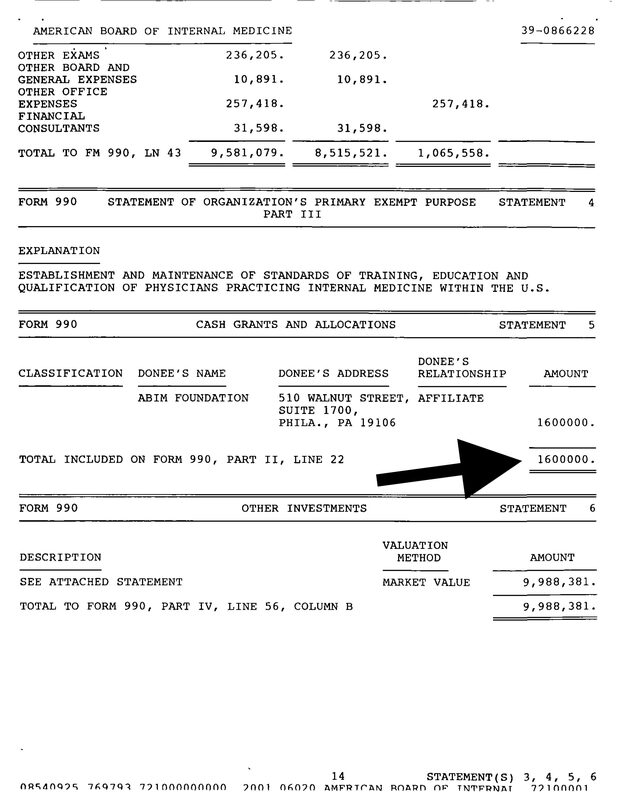 Does the President and CEO of ABIM and the ABIM Foundation really need to earn at least $7.2 million over the ten years ending June 30, 2013 while also earning additional cash on the side from multiple consultant positions? Sorry, but for the ABIM to hold fees stable given their self-serving largess is inexcusable. It's time for ABIM to drop its fees and cut their expenses. And then there's the whole collusion with our professional societies whose non-physician leaders profit handsomely from educational programs that support MOC. Too many ABMS and ABIM sycophants are earning far too much income on the backs of instilling fear amongst young physicians already struggling to pass their tests so they can maintain their job while increasingly drowning in educational debt. To already see ABIM sycophants congratulating "the ABIM staff and board for working to make MOC what it can become" with today's announcement given these realities is unconscionable, even if they are trying to be politically correct. MOC doesn't need to "become" anything. It is not a legitimate physician quality registry. MOC needs to go away. To that end, we should recognize that the American Board of Medical Specialties (ABMS) and their 24 member boards (of which ABIM is just one), lobbied Congress hard to etch themselves permanently in to the Affordable Care Act as a physician "quality" registry to affect CMS physician payments as part of our new health care law. But if the MOC program is indeed corrupt, what does that say about this means of paying physicians for the care they provide patients? How corrosive to the doctor-patient relationship might this program become? Recall that the ABIM has never studied the effects that failing a physician during recertification has on the physician or the patients that physician treats. The spin is that MOC assures physician quality. But if a physician can no longer practice because he loses his privileges to practice his art because he failed a computerized test insensitive to the physician's scope of practice, where does that leave his patients? Why has no one ever evaluated this? Might it never have been evaluated because the MOC program was always more about the money than a means of assuring quality patient care? I'm sorry, but an apology is not enough when there are so many unanswered questions and unethical practices underway by so many for so long - especially by those of our own profession who have turned against practicing physicians for their own benefit. It is time for a full Congressional investigation into the financial, legal, and ethical dealings of the ABIM, the ABIM Foundation, the legitimacy of the ABMS's entire MOC program, and to question the inclusion of such an irresponsible and corrupt physician quality measure into the Affordable Care Act. You see the real story today is not about the ABIM's changes to their illegitimate MOC program. Rather it's about how the MOC debacle has finally mobilized practicing physicians to advocate for themselves and their patients for what is right, whether the ABIM and their sycophants like it or not. I hope this helps you prepare for your upcoming Maintenance of Certification® examination(s). Please feel free to share with your friends! Doing so will show the world your commitment to the highest standards of "medical professionalism."